- Photos of Wrangell - St. Elias National Park and Preserve in winter. Images include Mount Blackburn photos, Mount Sanford Photos, boreal forest photos, winter landscape and scenic photos from Wrangell - St. Elias National Park. Lots of snow! For more photos of the park, visit the main Wrangell St. Elias National Park Photos page, and also the Photos from the Saint Elias Coastal Range page. Photo of Mt. Blackburn, Wrangell St. Elias National Park, Alaska. Snow-loaded willows, Wrangell - St. Elias National Park, Alaska. Winter dawn, Wrangell St. Elias National Park, Alaska. Sunrise over Chugach Mountains, Wrangell St. Elias National Park, Alaska. Mount Sanford, black and white photo, Wrangell - St. Elias National Park, Alaska. 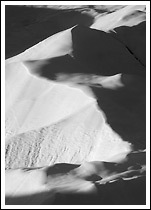 Abstract photo of snow patterns, Wrangell St. Elias Park, Alaska. Kennicott River embankment, Wrangell - St. Elias Park, Alaska. Snow laden spruce tree, winter, Wrangell - St. Elias National Park, Alaska. Photo of Wrangell Mountains, winter, Wrangell St. Elias Park, Alaska. Mount Wrangell photo, winter, Wrangell - St. Elias National Park, Alaska. Hoar frost covered spruce trees, Wrangell - St. Elias National Park, Alaska. Black and white photo, Nizina Glacier, Wrangell - St. Elias National Park, Alaska. Winter in Wrangell - St. Elias National Park and Preserve, Mt. Blackburn, Alaska. Kuskulana Glacier, Wrangell - St. Elias National Park, Alaska. Mount Blackburn, winter in Wrangell St. Elias National Park Alaska. Black and white photo of snow patterns on a hillside, winter, Wrangell St. Elias National Park, Alaska. Winter Kennecott Glacier, Wrangell St. Elias NP, Alaska. Wrangell mountains winter, Wrangell - St. Elias National Park, Alaska. Historic Kennecott photo, Wrangell St. Elias Park, Alaska. Photo of Mt. Blackburn at sunrise, Wrangell - St. Elias National Park, Alaska. Mount Sanford photo, Wrangell - St. Elias National Park, Alaska. Mount Sanford and the boreal forest, Wrangell - St. Elias National Park, Alaska. Mount Sanford photo, Wrangell - St. Elias National Park and Preserve, Alaska. Willow Lake and Wrangell Mountains, Wrangell - St. Elias National Park, Alaska. Kennecott Glacier, Wrangell St. Elias National Park, Alaska. Snow covered glacial moraine, Wrangell St. Elias National Park, Alaska. Crystalline Hills, Wrangell St. Elias National Park, Alaska. Photo of Kennicott River, Wrangell St. Elias Park, Alaska. Winter, Kennecott Glacier, Wrangell St. Elias NP, Alaska. Black and white photo of Mt. Blackburn, Wrangell - St. Elias National Park, Alaska. Wintertime, Wrangell St. Elias National Park, Alaska. Winter photo, Mt Blackburn, Wrangell - St. Elias National Park, Alaska. Wrangell mountains photo, Wrangell St. Elias, Alaska. Black and white winter scenic, Wrangell St. Elias Alaska. Photo of Balsam poplar trees in winter, Alaska. Gilahina Trestle, winter, Wrangell - St. Elias National Park and Preserve, Alaska. Winter, ice patterns Wrangell St. Elias National Park, Alaska. Winter ice patterns, Wrangell St. Elias National Park Alaska. Winter Donoho Peak, Wrangell St. Elias National Park Alaska. Winter, Kennecott River, Wrangell St. Elias NP, Alaska. Winter, Wrangell St. Elias NP, Alaska. ice wall, Kennicott Glacier, Wrangell - St. Elias National Park, Alaska. Kennicott River icing up, Wrangell St. Elias NP, Alaska. Snowshoe hare track in snow, Wrangell St. Elias NP, Alaska. Winter, Kennicott Glacier, Wrangell St. Elias NP, Alaska. Blue ice, Kennecott Glacier, Wrangell St. Elias NP, Alaska. Glacial ice, Kennecott Glacier, Wrangell St. Elias NP, Alaska. Winter, Stairway Icefall, Wrangell St. Elias NP, Alaska. Winter roads in Wrangell - St. Elias National Park, Alaska. Snow-covered rocks, Kennicott River, Wrangel - St. Elias Park, Alaska. Mt Porphyry, Wrangell Mountains, Wrangell St. Elias Park, Alaska. Alpenglow on Mt. Porphyry, near McCarthy, Wrangell St. Elias Park, Alaska. Kennicott Glacier, winter, Wrangell - St. Elias Park, Alaska. Image of Wrangell Mountains, Wrangell - St. Elias National Park, Alaska. Wrangell Mountains Photo, Wrangell - St. Elias National Park, Alaska. Photo of Wrangell Mountains, Wrangell - St. Elias National Park, Alaska. Kennicott Glacier Lodge, Kennicott, Wrangell St. Elias Park, Alaska. Photo of Mt. Blackburn alpenglow, Wrangell - St. Elias National Park, Alaska. Photo of Mt. Blackburn and alpenglow, Wrangell - St. Elias National Park, Alaska. Wrangell Mountains, Wrangell - St. Elias National Park, Alaska. Dawn, Wrangell Mountains, Wrangell - St. Elias Park, Alaska. Mt. Porphyry photo, near McCarthy, Wrangell - St. Elias National Park, Alaska. Snow loaded White spruce trees, winter, Wrangell - St. Elias National Park, Alaska. Mount Blackburn photo, Wrangell - St. Elias National Park, Alaska. Photo of Mt. Blackburn, Wrangell - St. Elias National Park, Alaska. Photo of Sunset on Mt Porphyry, winter, Wrangell St. Elias Park, Alaska. Sunset on Mt Porphyry, winter, Wrangell St. Elias Park, Alaska. Photo of snow-loaded willows, Wrangell - St. Elias National Park, Alaska. Winter, Wrangell St. Elias National Park, Alaska. Mt. Porphyry, Wrangell St. Elias National Park, Alaska. Porphyry Mountain, Wrangell St. Elias National Park, Alaska. Sunset, winter, Wrangell St. Elias National Park, Alaska. Winter cliffs, Wrangell St. Elias National Park, Alaska. Mt. Sanford photo, Wrangell St. Elias National Park, Alaska. White spruce trees, Wrangell St. Elias National Park, Alaska.